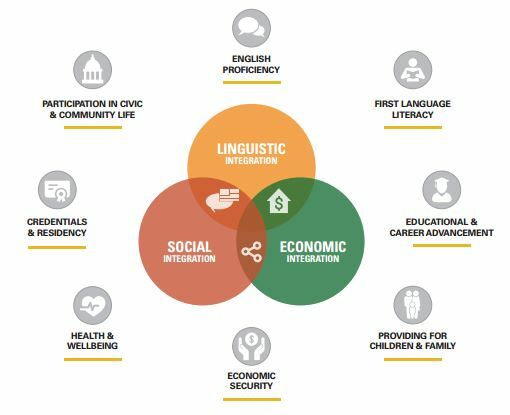 ALLIES led the way in developing a comprehensive Immigrant Integration Framework, offering an innovative way to identify and measure the critical factors for successful immigrant integration. ALLIES partnered with the South Bay Consortium for Adult Education (SBCAE) and Working Partnerships USA to develop an initial Immigrant Integration Framework as a basis for further development of an immigrant integration pathway. Throughout the design process, the project team received broad community and stakeholder input via community forum meetings, ALLIES ESL Provider Network meetings and conversations with South Bay Consortium for Adult Education (SBCAE) transition specialists. A core group of practitioners from community colleges, adult schools, community based organizations and local government agencies formed a design team that provided regular input as materials were developed. Each goal is further broken down into approaches (representing different pathways towards that goal) and supporting objectives (intermediate steps that may support progression towards the goal).